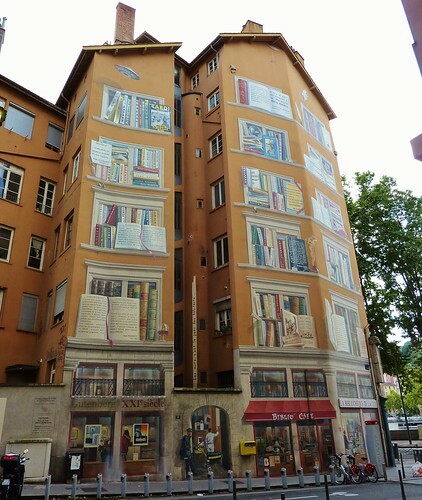 This is a collection of buildings which have a realistic mural (Trompe-l'oeil- French for "deceive the eye") painted on their façade which creates an optical illusion of large bookshelf with giant sized books. 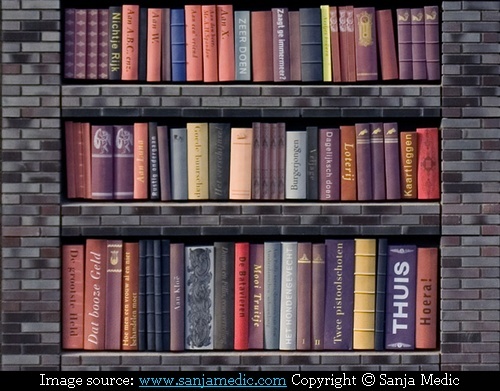 There are many murals depicting books but only those murals which illustrate a bookshelf have been included in this collection. Most of these works were created by actually painting with brush/sprays, few by printing on Vinyl/Mylar and one is made out of ceramic tiles. The collection will be expanded as and when I find more such bookshelves. My readers can also help me in finding new ones. This is the most famous of the bookshelf building and perhaps the earliest. 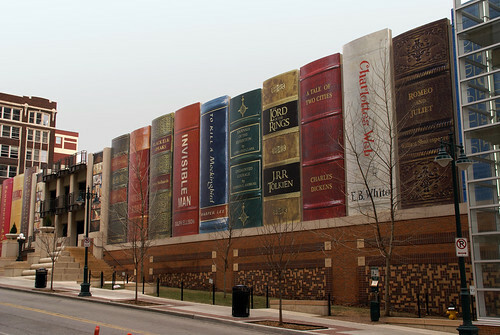 The façade is made of signboard Mylar and show cases 22 titles (full list) on a wide variety of reading interests, suggested by Kansas City readers and then selected by The Kansas City Public Library Board of Trustees.The book spines measure approximately 25 feet (7.62 metres) by 9 feet (2.74 metres). A bookshelf painted on the wall of a school building in a school in Tyumen by the art group ‘Color of the City’. Brain child of Dmitriy Zyelyenin who along with Syergyey Shapoval, Lyena Koorash, Dima Danilov and Boris Nyepomnyashshiy created this giant mural. As per painters they had never painted on such a big canvas (200 square meters - 2150 Sq. ft.) and had never worked on high scaffolding. Source of info: adme.ru (In Russian) (English Translation). Page contains some nice pictures while it was being painted. Located in Rossiysky prospect, the local Energy company (TEK) painted the two walls of a transformer substation into a stack of books. The mural contains some famous titles like; The Master and Margarita, Three Men in a Boat, as well as company's own manual for "Emergency and Recovery Operations. 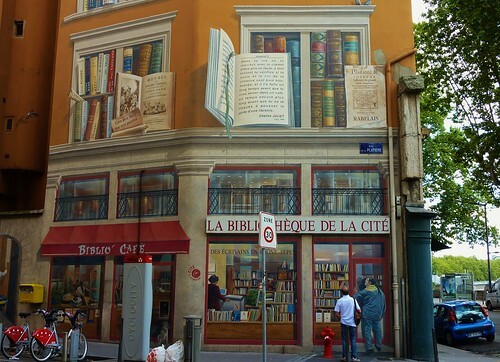 The mural at the Municipal Library (La Bibliothèque De La Cité) is part of the beatification plan of the city. The 400 Sq. metre (4,300 Sq. ft.)mural on the façade of 4-5 upper floors of the building was created by CitéCréation. The mural titled "The Knowledge" was created in 2010 by Harrell Fletcher with Avalon Kalin. Book titles reflect education and sustainability efforts and were chosen by a poll of students, faculty and staff. 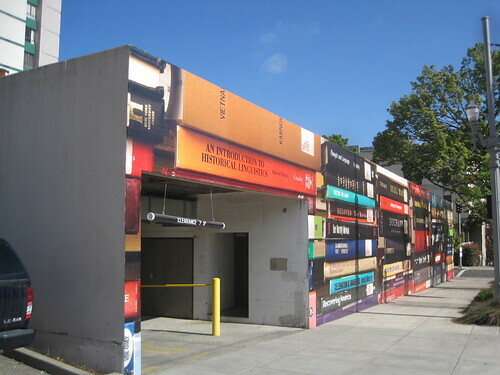 The mural was made by actually stacking the selected books, photographing the stack, creating a large vinyl bill board from the photograph and finally pasting the billboard on the blank wall of the building. It was selected as one of Americans for the Arts 2010 Outstanding Public Art works. The mural at Circle City Books was created in 2012. Initially it had forty-eight titles. Later in June 2013 three books (thehorizontal stack ) were added through a local competition. The books include"The Hope of Liberty" by George Moses Horton, "Light in August" by William Faulkner, "I Know Why the Caged Bird Sings" by Maya Angelou, and "Cold Mountain"by Charles Frazier (full list). 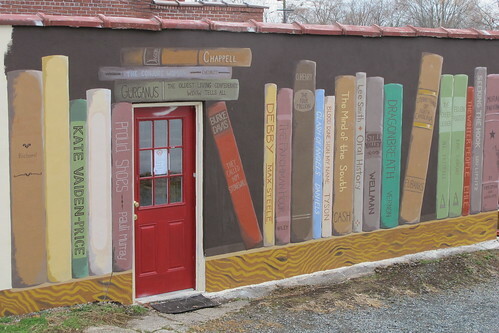 A mural painted on the back wall of the Eborn Books (formerly Sam Weller’sBookstore). The mural shows the spines of some classic books and Utah cult favourites. Mural on the side wall of the Loganberry Books on Larchmere Boulevard, Shaker Heights,Cleveland. The 22.5 metres (74 ft) long mural was created by local artist Gene Epstein. Printed on vinyl-coated polyester, the spines displayed include a wide variety of books. As per the artist, "the criteria we had was that the books should be 25 percent children's literature, 25 percent related to the Larchmere community, 25 percent representing the businesses, and 25 percent about Cleveland." The books were nominated by community members and finally selected by a committee of residents and shop owners. 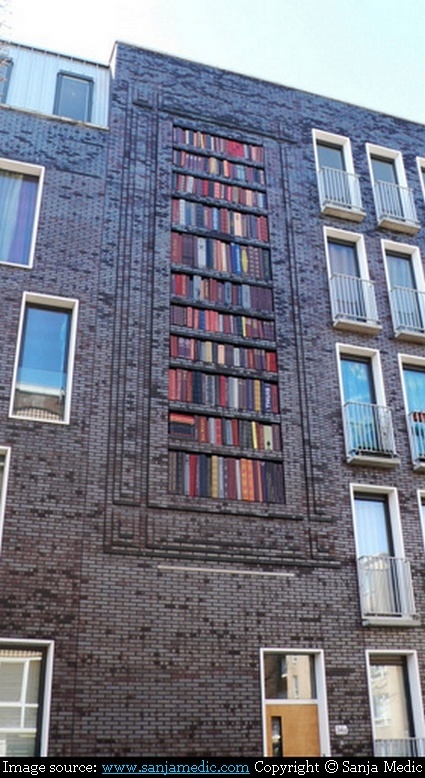 This Mural on the façade of a residential building in the Lootsstraat, Amsterdam is unique as it is made of coloured ceramic tiles which represent specific books. The mural which has 250 unique, ceramic books was created in 2006 by Dutch artist, Sanja Medic in collaboration with the ceramist P.Kemink (Koloriet, Amsterdam) and graphic designers Melle Hammer and Susanne Laws. The mural is titled De Batavier (De Boekenkast) (Boekenkast = Bookcase) and the the building on which it is made is in a neighbourhood where streets are named after Dutch poets and writers from the 18th and 19th century, namely C.Loots (Lootsstraat), van Lennep (Jacob van Lennepstraat), Heije (Jan Pieter Heijestraat), J. Kinker (Kinkerstraat) and A.C.W. Staring (Staringstraat). Each book in the mural carries the title of a poem from one of the above referred poets or a drawing from the famous 18th century book by Johan Enschede. Permission by Sanja Medic to use images from www.sanjamedic.comis thankfully acknowledged. 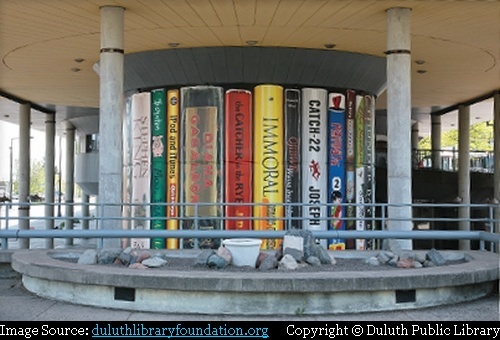 A bookshelf mural in the Duluth Public Library plaza. The 7 metres (23.5 ft.) tall mural, titled "Books on the Plaza" was painted by Scott Murphy, a local muralist. The selection of the books was based on suggestions from public, library staff and the artist and the main criteria was to depict range of the library's collections, books with decorative spines and books of local interest and significance. Painted on the side wall of Collège du Sacré-Cœur de Sherbrooke by team M.U.R.R.I.S. (Urban Murals for the Revitalization ofBuildings and Social Reconciliation), the mural titled "Heart, Culture andPedagogy" was completed in 2011. 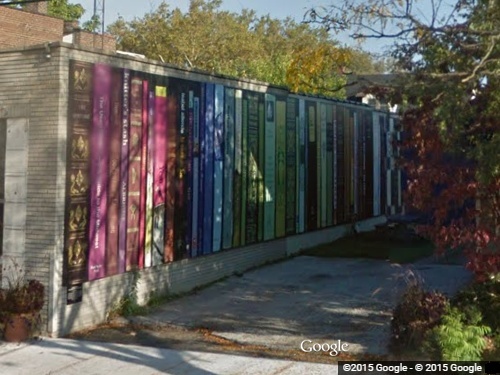 The 11.9 metres (39 ft.) wide and 12.8 metres(42 ft.) tall mural showcases books from more than 100 authors and was created as a part of beautifying the city and increasing the tourist appeal. Copyright: Images from Flickr / Panoramio /Wikimedia Commons and other sources are under the copyright of their owners. Actual terms of copyright/reuse is available in the source link given below the image. Note: This is a duplicate post of an original post made in Google Earth Community. These are simply great. Thanks for posting! Thank you Diane. I am happy that you liked the post. I have given link to this post in three main collections of mine. Thank you syzygy for including link to this post in your Mural posts. I am happy that you have liked it. I must compliment you on your collection. These are great posts and must have taken you lots of time. ...must have taken you lots of time. no way! -you know: when it is not easy I go to F&G immediately! also very glad you liked em! 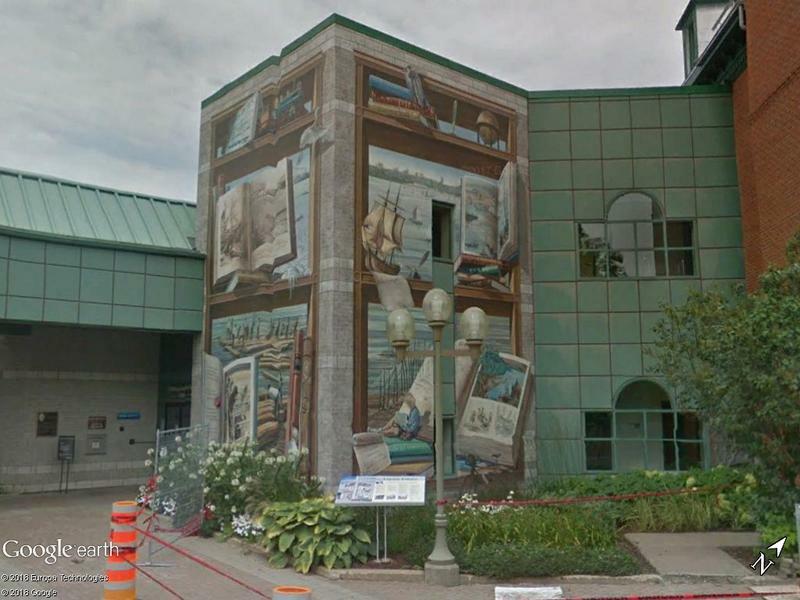 A 120 m² mural from 2002 in front the library in Levis St-Romuald, Quebec. The fresco was createt from Murale Création. 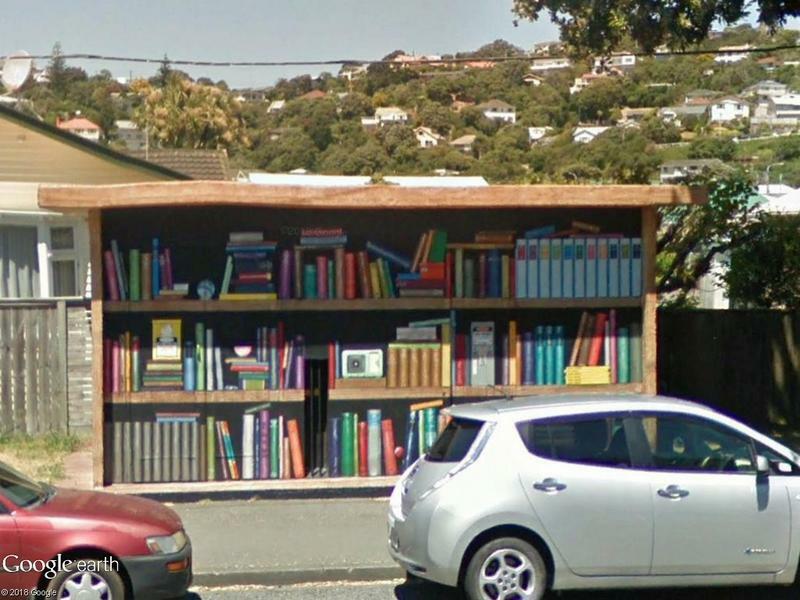 A bookshelf at an electrical distribution station in Miramar (New Zealand). 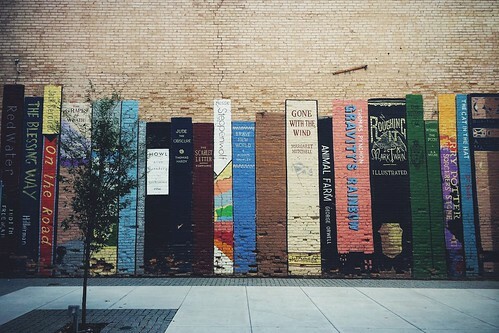 bookshelf-style mural by Mantra, Luxemburg. Thank you willi1 and syzygy for the posting about the additional murals. My apologies for late response. I will add these shortly in my collection.